The Wyndham Westward Look is a Tucson hotel with historic charm and modern luxury. Westward Look is one of Tucson’s first and finest resorts. Built in 1912, it has long been a favorite Tucson vacation destination. Its location provides stunning views of the Catalina Mountains and the City of Tucson. Westward Look Wyndham Grand Resort & Spa gives guests the opportunity to get close to nature. Although close to Tucson, the secluded property seems miles away from everything. Westward Look Tucson guest rooms are clustered in buildings around the main facility. 4 guest rooms per building. The large 80 acre property and open areas create a relaxful setting. A big benefit of the large property are on-site hiking, biking and horseback riding trails. OH, did I mention the views? Breathtaking views are part of every meal at the resort’s restaurants. Both the Lookout Bar & Grille and the GOLD restaurant have walls of windows. The award winning GOLD restaurant blends innovative contemporary American cuisine with local inspired flavors. The GOLD restaurant is more formal. And at one time, all restaurant wait staff wore tuxedos. But while the tuxedos are no longer, the service remains unmatched. The Lookout Bar & Grille is a more casual dining option. The menu presents an array of tempting dishes. And deserts. The tranquility of the desert extends to Westward Look Wyndham Grand Resort Sonoran Spa. The spa is one of Tucson’s top spas. Its pampering staff provide unique treatments that will relax and replenish the soul. Westward Look is a distinctive Tucson resort for your next get away vacation. Or a great venue for your business meeting. Westward Look has 16 conference rooms and over 20,000 square feet of meeting space. It is able to host small gatherings or large conferences. The Westward Look Wyndham Grand Resort & Spa awaits your next visit. Westward Look began as a family home a few short months after Arizona reached statehood. The population of Tucson at the time was but 13,000 residents. But to William and Maria Watson, Tucson AZ was the place to build their dream home. They bought 172 acres of homestead land 8 to 10 miles north of the City of Tucson. Being far removed from the growing city was exactly what they wanted for their dream home. The Watsons engaged the services of Meritt Starkweather to design their home. Starkweather was a noted Tucson architect of the time. Adobe homes were popular during this period in the Southwest. And Starkweather designed an Adobe home that realized the Watson’s dream. The home created by Starkweather had spacious living areas and a traditional Spanish courtyard. The views of the Santa Catalina Mountains and desert vistas were stunning. What was later discovered was that Starkweather did not use real adobe to build the home. The wall construction used concrete and steal finished with adobe. Wood beams transported from Mt. Lemmon supported the ceilings. These “vigas” beams are a distinct feature of a southwest style home. What was the Watson’s living room is a central area of the Westward Look Wynhdam Resort and Spa. It is the Vigas Room named for the log beams. The ocotillo branches covering the ceiling have been there since the home was build in 1912. In the 1920s, wealthy visitors from the east coast and mid west discovered Tucson, AZ. Visitors found it a perfect place to escape the winters back home. To take advantage of this new found source of income, 15 cottages were build on the land around the home. The Watson’s created a unique place in the Sonoran Desert for their guests. By the 1940’s the Watson estate had become a thriving and popular dude ranch. Under the ownership of the Nason’s, the thriving business became Westward Look. The resorts name comes from a poem by Arthur Hugh Clough. The poem made famous by Sir Winston Churchill on April 27, 1941. As its popularity grew, guests returned to Westward Look year after year. Some staying for a few weeks and the more affluent for months at a time. In the late 1960s, the Nason family sold the property. It was then developed into Tucson’s first resort. It provided guests fine dining, deluxe accommodations and banquet facilities overlooking the city. By this time Tucson, AZ had grown to more than 260,000 residents. In 1972, the main restaurant at Westward Look became the Gold Room. That began a 25-year tradition of tuxedoed waiters preparing continental dishes table side. In 1996, the Gold Room changed to a more casual with elegance style. Waiters no longer wore Tuxedoes and the menu changed to Southwestern fare. Today, Westward Look Wyndham Grand Resort & Spa continues to be a top Tucson resort. It encourages guests to discover the unique qualities of this lush Sonoran Desert it is in. In 2010, the resort underwent a $14 million dollar renovation. New color schemes draw on the natural elements of the lush desert landscape. Westward Look Wyndham Grand Resort & Spa maintains it place in Tucson history. It has evolved over the decades but remains steeped in authentic Southwestern charm. 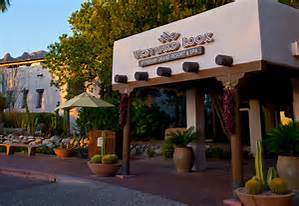 Westward Look Resort was the first true resort in Tucson, AZ. From its simple roots as a couples dream home to the modern Wyndham Resort it continues its tradition of Tucson hospitality. Tucson has a host of places to see and things to do. All just a short drive from the Westward Look Resort. Suggestions include the DeGrazia Gallery, Sonoran Desert Muesuem and San Xavier Mission. If you are visiting Tucson and interested in see your “future home” in our great city, give us a call. We would be pleased to show you around and find a home to meet your needs.